It takes a neighborhood to preserve and protect a neighborhood. It also takes a lot of neighbors willing to come together, dress up and share stories. Today we recognize the second successful fall walking tour event hosted by the Harris-Kemper Historic District Neighborhood Association and the example it sets forth of cooperation around a shared goal. St. Joseph has some of the Midwest’s most interesting architecture scattered throughout the city, with several National Register neighborhoods. One of these is the historic and intriguing Harris-Kemper Neighborhood, located from 18th to 20th streets and bordered by Francis Street. Not only are there stunning examples of late 19th century architecture – and many even older than that – there’s a movement there to collectively share the stories of the home’s original owners and to keep the community interested in preserving these tales. For October, the tales take a spooky twist, with homeowners sharing their own unexplained experiences. Ticket holders stroll along and listen to the tales in small groups, but also get details and a chance to study the intricate work that went into each home’s design and construction. 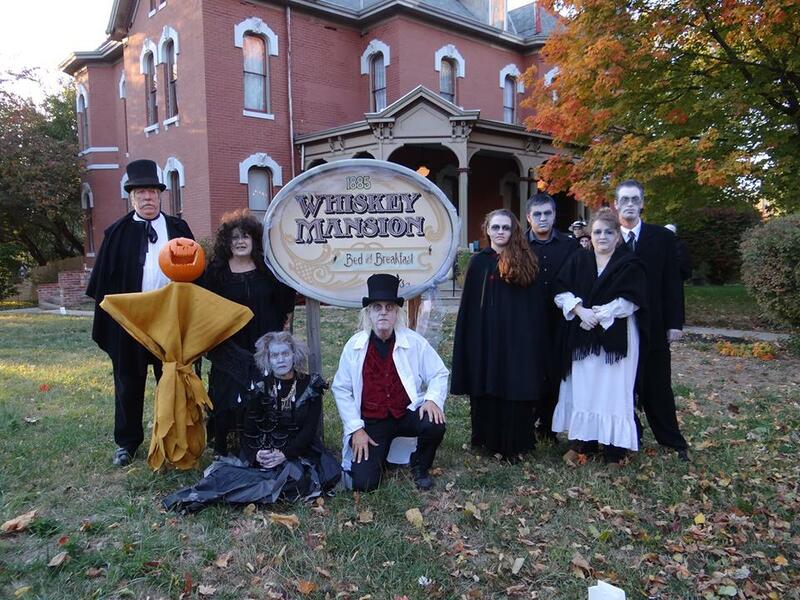 Kicking off at the majestic and mysterious Whiskey Mansion, guests enjoy treats, a chance to mingle with neighborhood residents and to see a variety of late 1800s-inspired costumes. Proceeds go right back into preservation efforts. Across the neighborhood tour, which is all coordinated by a volunteer effort, guests truly get the feeling that these people whose lives reflect a diversity of ages, professions and interests truly are a neighborhood. They’ve placed professionally-designed street signs to denote their neighborhood, and many know the story of various homes from participating in preservation efforts both locally and at the state level. There’s a sense that you’re welcome to join this eclectic group and they’d be happy to have you. Using Facebook and lots of colorful photos, the Harris-Kemper Historic District Neighborhood Association has booked the event solid two years straight, with plans to continue sharing these tales each year. Sure, it’s spooky fun, but learning about the early business and community leaders who make our city great is also very entertaining. Some early residents were friends with Albert Einstein; others invented Aunt Jemima pancake mix; others were Civil War generals or legends in the whiskey business and went on to found the national organization still thriving today, Big Brothers Big Sisters. From a snapshot view, the use of high-quality signage with a repeated neighborhood name has become an official logo for the area. The stories are repeated across several formats and laced with historical fact. Neighbors are encouraged door-to-door to participate in the event, and they are mindful and courteous of the dozens of walkers one evening each year. Social media helps sell the tickets, boost the brand and keep the interest alive. And ultimately, this is storytelling demonstrated in fine style, utilizing volunteers creatively to help others appreciate and understand the grand history we have in this part of town. Thank you Harris-Kemper Neighborhood residents – both current and past. This entry was posted in Monday Morning Coffee, Social Media Marketing, Storytelling and tagged blog, build brand value, company brand, engage customers, Facebook, Susan J. Campbell Copywriting Solutions. Bookmark the permalink.